From the One Minute How-To Podcast via Odeo.com, here is some advice on how to leave a great impression during your job interview. I just found out that Monster.com is podcasting career advice. A little more audio for your commute or work-out. I've subscribed but haven't had a listen yet. I am very proud of how I landed my first job out of college. It was 1994, and I had spent lots of time at the library, researching the hidden job market and looking for leads. I had posted a resume at the University of Cincinnati's Career Development and Placement office, and I guess they made a database available to recruiters. My sister had recommended a book entitled 300 New Ways to Get a Better Job by Eleanor Baldwin. Nevertheless, I found that very useful and would recommend it to any graduate or especially students in an online degree program, since they don't have access to a career center. So one summer day that year, Mark, the Environmental, Health, and Safety Manager for a company that manufactured decorative items for homes, called me. What was meant as an initial screening call turned into a full-fledged telephone interview. When I hung up, I had made an appointment for an in-person interview. Not having a car of my own, I was able to borrow a friend's. I spent the next days before the interview at the library, researching all I could on the company. At the interview my enthusiasm for the position as an Environmental Engineer was strengthened, especially as I convinced Mark to take me on a quick tour of the plant. I made sure to share some of the information I had found from my own research, which seemed to impress Mark and Jim, the HR Manager who also attended the interview. At the end of the interview, I asked what more I could do to qualify for the job, conveying my strong interest. Immediately when I returned home, I typed up a thank you note to both Mark and the HR Manager who also interviewed me. Then I both faxed and mailed it. Within a week Mark called me to offer me the job. I accepted it and wound up moving an hour north to Dayton, Ohio, where I lived for ten years. 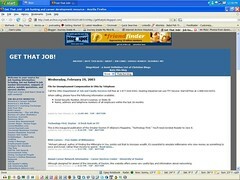 The Internet has certainly changed the way we can look for jobs and how employers can find us. This worked for me back in 1994. Do you have a job-hunting success story you'd like to share? Please send it to me at daniel [at] getthatjobonline [dot] com. 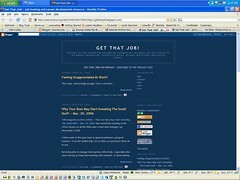 Note: I've updated this post to include some additional links to affiliates and others that I recommend you check out. If you've been around this blog throughout its nearly 5-year history, you'll know that the general layout hasn't changed that much. Until today. I encourage you, if you're getting this content via an RSS subscription to stop by the website at getthatjobonline.com to see how it looks. Blog archive by year and month (love those twisties!) - did I really have 416 posts in 2003? Wow. Let me know what you think - I'm not necessarily sold on the template layout just yet, but it's a nice change.